Today is the release day for Star Wars on Blu-ray! I've been anticipating the release with my Star Wars ABC's...and we're now up to the letter "R."
Childhood memories are funny, fuzzy things, but I distinctly remember going to see Return of the Jedi with my parents and brother. I also distinctly remember how large the Rancor looked on the big screen. A fearsome, loathsome, scary, and mistreated beast, the Rancor is Jabba's favorite way to dispose of those who disappoint or betray him. 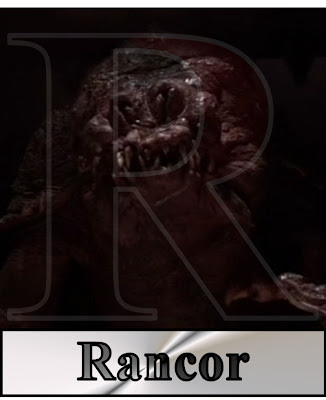 With the press of a button, they go into the Rancor Pit, where the starved behemoth is ready to catch its quarry and have a much-needed snack, all while Jabba and his demented court watch and place bets on how long the poor victim will last before the Rancor grabs it in its clutches. Nothing cranks up the emotion like a shirtless fat guy crying. MONDAY: Let's call it the Humvee of the Imperial fleet.